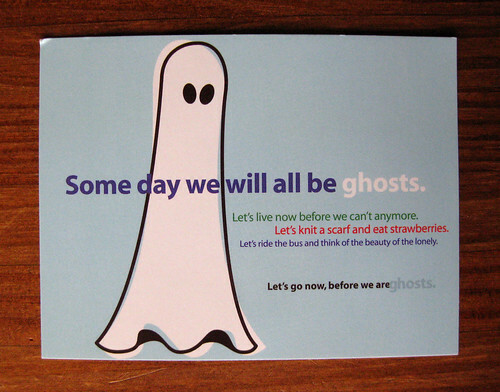 Some day we will all be ghosts. Let's live now before we can't anymore. Let's knit a scarf and eat strawberries. Let's ride the bus and think of the beauty of the lonely. Let's go now, before we are ghosts. I wanted to let you know the shock I received today when my roommate handed me your letter! I think Austrian Post has been trying to beg my forgiveness for its earlier unruly behavior; that's two letters in the last week that only took four days to cross the Atlantic and get to their destination. I've been really sick the last week so things are piling up on me, but I am planning to respond if not by the end of the week then on the weekend! The second to last line of this makes me shiver. I've never seen beauty in loneliness and I can't imagine I ever will. 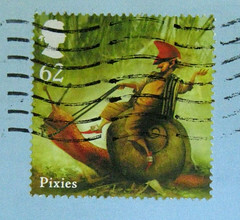 I do like the design of this card though. Wow, one letter never made it and one gets there in 4 days! That's nutty, but I'm ever so glad this latest reached you. Oh, I've found beauty in loneliness before... but we're all different.